AM Live is Audiomotion's unique, online viewing platform and selection application designed to track and log your shots as you capture them. The multi-view feature allows you to follow the action from all angles including Live Action, Blade/Shogun and Real-Time Outputs so your colleagues can login in Real-Time and view the live session. Your pre-loaded shotlist makes tracking takes even easier. No more excel sheets! Mark your preffered takes with the click of a button, keep notes, log props and other important information. 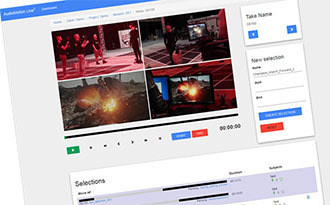 The wishlist and cart features allow you to manage and monitor your chosen shots, evaluate number of seconds selected so you can purchase your animation with ease. Projects are live up to 3 months or more so you can revisit your session at any time and make further selections.